How TERRORISTS can get in! It reads like a plotline from the hi-tech Mission: Impossible spy films. Elderly white man in flat cap, brown cardigan and thin-rimmed specs boards plane in Hong Kong and alights in Canada as a young Asian man. However, the suspicions of eagle-eyed staff as he was boarding were aroused by his strangely youthful hands. And when the old man didn’t disembark the flight at Canada’s Vancouver airport, police swooped and discovered an astonishing plot. In what Canadian authorities are describing as an ‘unbelievable case of concealment’, it transpires that the young man had boarded the plane in elaborate disguise with a silicone face and neck mask – and switched identities in the plane toilet in mid-air. An intelligence alert released by the Canada Border Services Agency (CBSA) stated: ‘Information was received from Air Canada Corporate Security regarding a possible imposter on a flight originating from Hong Kong. ‘The passenger in question was observed at the beginning of the flight to be an elderly Caucasian male who appeared to have young looking hands. On landing, the passenger was escorted off the plane by Border Services Officers, who he then asked for refugee status. The passenger, who isn’t being named due to privacy laws in Canada, initially denied the incident, claiming he had only the one bag he was carrying. But when the authorities confronted him with two more bags, one of which contained the peeled-off silicone face and neck mask, he capitulated. The alert stated: ‘One bag contained the subject’s personal clothing items while the second contained a pair of gloves. 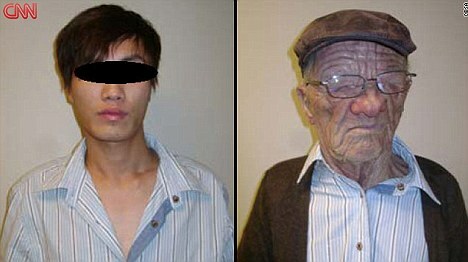 The authorities then requested the passenger put the disguise back on so they could confirm their suspicions, and noted that he even mimicked the movements of an elderly person for them. Jennifer Bourque, regional communications officer for the CBSA, confirmed the body had ‘intercepted an individual, on October 29, attempting to enter Canada under false pretenses on-board an Air Canada flight. The agency refused to reveal several details about the man’s disguise but did disclose he had embarked with a boarding pass belonging to another passenger. ‘It is believed that the subject and the actual United States Citizen passenger (whose date of birth is 1955) performed a boarding pass swap, with the subject using an Aeroplan card as identification to board the flight,’ stated the alert. Aeroplan is a credit card where card holders can earn frequent flyer miles. ‘We can confirm that officials from the CBSA met a passenger arriving off AC018 Hong Kong to Vancouver on October 29 and the matter is still under investigation,’ said Air Canada spokesman Peter Fitzpatrick. Mr Fitzpatrick pointed out that there are multiple identity checks that occur before passengers leave Hong Kong international airport, including Chinese government-run Hong Kong passport control. Hong Kong officials are aware of the incident. 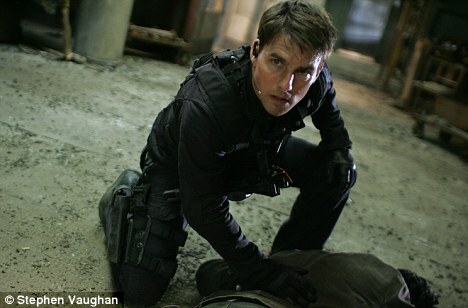 The type of mask, covering the face and neck, is similar to the ones used by Tom Cruise’s character Ethan Hunt in the film Mission : Impossible II. Characters in the hi-tech secret agent film repeatedly conceal and change their identities by donning and removing similar latex masks. At one point, someone even uses a mask to pose as Ethan Hunt on an aeroplane. Previous Roshonara Choudhry supporters are living on Kuffar!